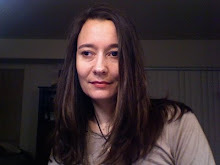 As crazy as it sounds, I have added new content to my poor neglected webpage. 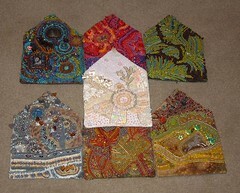 All of my beaded journal houses altogether, in one spot, with a bit of history. maybe i will add more about each house later. this photo was taken my Audin Malmin of Angry Viking LLC. these are 5 beaded buttons i made this weekend. i actually had not confirmed i would be teaching a class then, i thought i would put these on etsy. but now they will be my class samples, i will have to do some more for etsy. what colors do YOU like best? 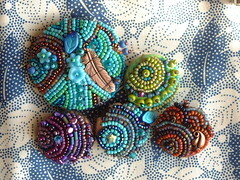 I will be teaching a class on making Beaded Buttons in Bellevue Washington at Quiltworks / Beads and Beyond on August 21st. http://www.beadsandbeyond-wa.com/ on August 28th. It's a 6 hour class and will be listed on their website soon. 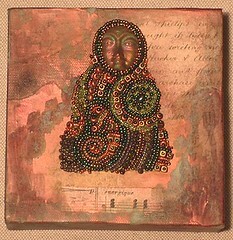 this is a painting i made a few years ago.. this beaded painting incorporates a raku face from rama. 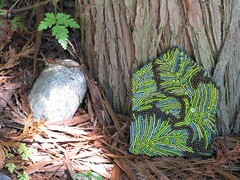 i am planning to do a new series of beaded painting using ceramic faces from earthenwood studio. i finished the back of my medici coat. there there are 6 yarns used. this little guy is about 2" in diameter. 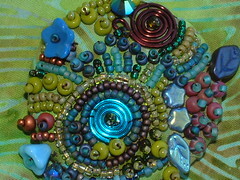 i make these by sewing beads onto cloth and then stretching around metal button forms. (you see those in fabric stores, they are meant to be covered with fabric to match clothing.) for this one i used seeds beads, glass leaves, stars, and flowers, a swarovski crystal bead, and wire coils. 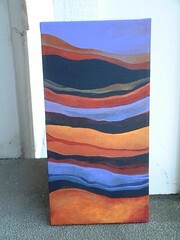 this painting is done too. (oh excuse how bad my balcony looks, it is supposed to get resurfaced this spring i think!) anyway.. it turned out a little "cartoony" so i am not sure entirely how i feel about it, but it's done and on to the next painting! 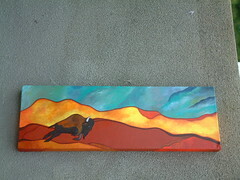 i may have showed you this painting in progress.. it's done now. 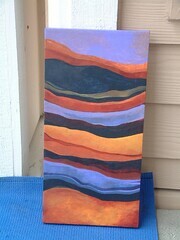 it's part of my "strata" series. i was actually studying geology at college, before i got waylaid by a career in fine arts administration (for lack of a more general term) but science still influences my personal artwork! i am very happy with this painting and have started the next in the strata series already..
these are the forest witch leg warmers that i made for my friend soren. 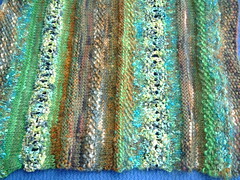 i used a wide variety of yarns, including lorna's shepard's worsted, manos, louisa harding sari ribbon, and more. 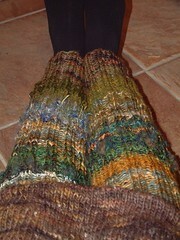 shown here with my han dknit pencil skirt, knit from hand maiden's ottawa in earth. 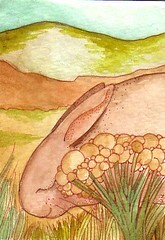 admittedly this is partly a test post on my part, but also a chance to show you a nearly-done painting. i had this urge to throw a periwinkle / lavender into the color scheme i have been using and play up the ochre. also switched from emphasizing the burnt umber as the dark to emphasizing payne's gray - which i just love. it's such a deep and gorgeous color. i'd like a whole wardrobe in it. i am sure people would think me boring but i would not care. good morning and happy easter. have a bunny. please don't eat the ears. i have been reading some books recently with plucky female heroines, of which i do approve. This series has not one but TWO plucky female heroines, Emmaline herself, a plucky young aviatrix, or at least designer of flying machines, and her friend the fearsome Princess Purnah of Chiligrit. Not to mention their sidekick, Rubberbones, the boy who bounces off anything. Young Theodosia's parents are a curator and an archaeologist and she and her cat Isis have their hands (and paws) full as members of a secret society dedicated to ensuring that the powerful dark magic associated with certain artifacts is not allowed to fall into enemy hands. These books have been compared to Nancy Drew meets Indiana Jones. And finally I just finished China Mieville's Un Lun Dun. It sort of reminds me of Alice in Wonderland and Spirited Away. Two girls find themselves in an alternate London that is being overtaken by sentient Smog and one of them becomes an anti-hero. If I had children, this is the sort of thing I would want them to read. i took the day off work, slept, read, knitted, and then went out and got my bow, which was being re-haired, sat in the park and knitted, and went to the library. it was a pretty good day. 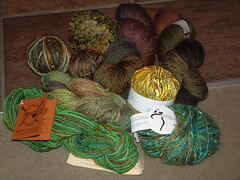 yarns include: lorna's shepard worsted, crystal palace party, dune by trendsetter, spincycle blue faced leicester wool, patagonia natural cotton, manos, and more to be added. i checked gauge, cast on 120 stitches, and off i go. i am glad i went out tonight, though if i had analyzed the weather first i might well have skipped it. it is absolutely miserably wet out. i feel bad for the folks i know out at fort warden, though it is supposed to be nicer tomorrow. i went to michael alm's opening at some space gallery and am inspired by his fanciful faux taxidermy to go back and work on some projects of my own which have never made it past design stage -- mainly a beaded nautilus sculpture and a pair of beaded deer dolls. the deer dolls i actually conceived in the last week or so and acquired antler tips to use for their horns. the nautilus shell has been waiting for its sculpture for at least 5 years, probably longer. anyway, it was good to see another artist inspired by natural history, as that is an area of much fascination for me and has inspired a lot of my art as well. and while art can serve many functions in think the function of inspiration is my favorite. now to attempt to get warm and dry.